There is no such thing as “gone” when someone can live on in your memories. Show you’re always living a Vulcan inspired life with the Star Trek 50th Anniversary Live Long and Prosper T-Shirt. 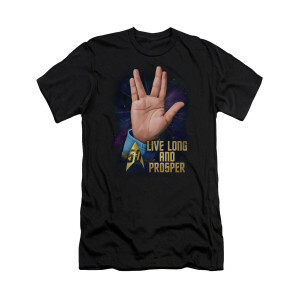 The soft black tee features the vulcan salute and the indelible words “Live Long and Prosper”. My husband got this shirt for me and I love it! The shirt fits well and seems to be made out of good material. Bought this shirt as a gift for my dad - he loves it! The XL fits exactly as we had expected, and the print is great quality!